Nothing caps off an adventure or a campaign like a boss battle that your players will remember for years to come. Here are six ways to ensure that the end of your next scenario is a memorable one. When Luke Skywalker entered the cave on Dagobah at Yoda's request, the sudden appearance of Darth Vader was startling -- not just to Luke, but to the audience as well. How could the final battle be happening here, now? We all knew that Luke would ultimately face off against Vader -- the entire trilogy was building to that battle -- but our sense of drama and narrative intuitively told us that something was wrong with this picture. Scene after scene of Vader aboard intimidating, imperial vessels foreshadowed the eventual climax aboard the largest, most terrifying piece of imperial technology yet: the Death Star II. Foreshadow your final battle so that your players see it coming and recognize that they are in the midst of the ultimate showdown. The worst thing that can happen after your boss fight is your players asking, "Wait; was that it?" This battle is the climax of your adventure: the point of greatest intensity. That means that you have to grow that intensity, the anticipation, so that your players feel as though everything has been building up to this moment. 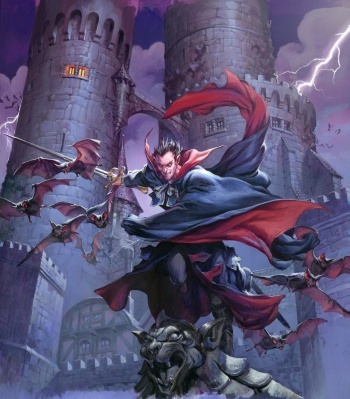 Introduce your villain early and often in your adventure so that by the time that final battle comes, your players are chomping at the bit to get a piece of him. If you wish to keep an air of mystery about your villain, then you can introduce him indirectly, be it by hearing him referenced by others or by seeing the results of his actions. The final battle ought to be more spectacular than any that came before it, so pick a suitably epic location. Your spoken descriptions grant you an unlimited special effects budget -- make use of every penny. Pyrotechnics, floating castles, thunder and lightning, crumbling towers, armies waging war in the background... You want the battlefield to be memorable. If your setting is low fantasy or your plot is a murder mystery, just remember that the final battle should be cast relative to what came before it. An investigative adventure that included a tavern brawl and an alley scuffle can end with a confrontation in the Grand Library amidst a downpour of falling parchment and bookshelves tumbling like dominos.